This is not where Johnnie’s girlfriend, Hellene, lived, and my friend is pointing this out. This is not where Johnnie’s girlfiend, Hellene, lived, and my friend, again, is pointing this out. However, geographically, I have Hellene living in these two buildings which face each other on Highland Ave., but not really as she lives more like a couple blocks down and in a fictitious taller, bigger building with no landscaping that’s well integrated into a small shopping area. Geographically, she is in this area as I have her fleeing the opening car wreck on foot for her home, and as these buildings are around the corner and a couple blocks down from where the car wreck that never happened takes place, bits and pieces of the terrain went into the imagining of her fictitious apartment building. Johnnie retched into the hundred year old porcelain toilet bowl. Up close and personal with the irreducible privileges of a thousand previous tenants, eased then and there the romance of the building having been for decades the dumping ground of junkies and prostitutes, which transitioned into counter-culture chic with the residence of a few publicity sharp guitarists, then not-so-subversive collegiate chic, and now purchased higher rents with the application of fresh cheap paint and vinyl flooring, but not new plumbing fixtures. The perpetual, narcissistic reek of urine that clouded the cracked bowl for several feet, mingling with the sharp chemical aroma of the flooring, both belittled and amplified misery. You know how it is in dreams where you visit a place you used to live, even a place you might currently live, and the place in the dream is that place but on the interior bears no resemblance, and is likely in its own world of a neighborhood? That’s how this is. [highlight highlight_type=”italic” color=”yellow”]Click on the book to read a FAQ on Thunderbird and the Ball of Twine and maybe even purchase. What is being pointed out here? Where are we? Should I tell you? 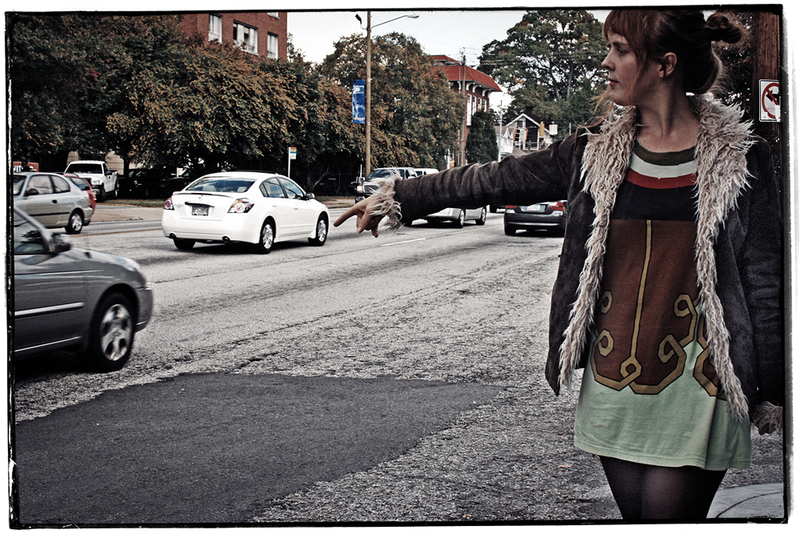 Should you guess where it is my friend is standing and why she is pointing out a mess of a highway that plaintively begs for repaving? If I tell you this is Atlanta, Georgia, would you be able to figure out where she stands? Wouldn’t hurt if you read the title for the photo? 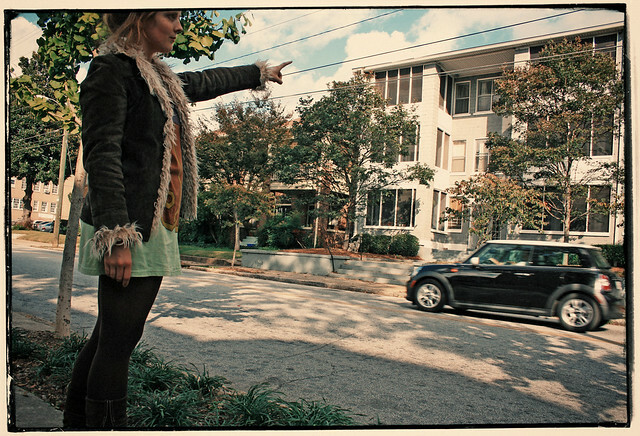 Yes, we are at the intersection of Ponce de Leon and Highland. This is where, right here, at the very beginning of the book, Johnnie Jackson is driving Hellene home, they are arguing, a black dog runs into the road in front of his car, he swerves to avoid hitting it and collides with Odile McDonald. 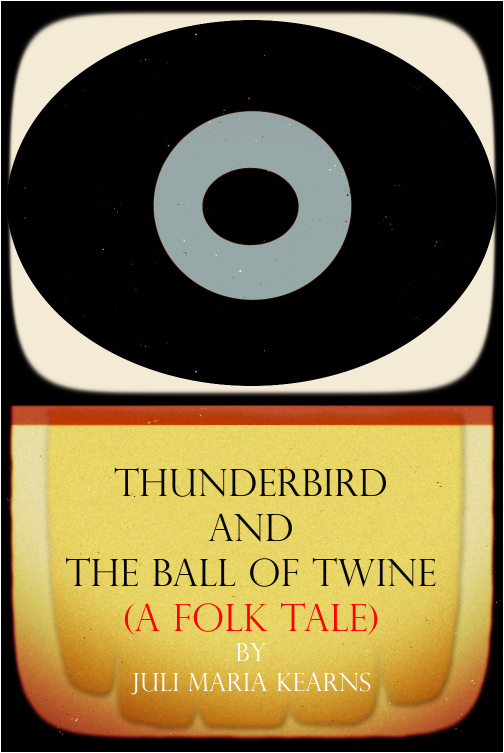 Thunderbird and the Ball of Twine isn’t a novel about Atlanta–in fact, Atlanta is intentionally never once mentioned in Thunderbird as I didn’t want to pin the action to any one place except to suggest, at the beginning, the setting was a city in the east. But Atlanta serves as an essential backdrop, at least how I envisioned portions of it for the book, so I thought I’d do some posts revealing some of Thunderbird’s geographic anchors. Though not too unlike how this area of Poncey-Highland currently imagines itself, the description in the book is a conglomerate of several co-existing eras. Just as if you were standing in a Google map on the corner of Ponce de Leon and Highland, and you peeled back one partial layer after another of prior Google maps, you would never feel a “Where am I?” disorientation despite the fact you’d be standing in neighborhoods of different temperaments that have become a present cement of pre-existent fragments. A grocery store is nearby, as in the book, but in the book’s mind the Publix squashes up a little closer with the shopping strip that is here–which has the Plaza Theater (Atlanta’s oldest continually operating cinema) and an Urban Outfitters and The Righteous Room bar and the Majestic Diner which dates from the 1920s and pairs with the cinema as being the two classic landmarks on this stretch of road. There was never a black dog to appear out of nowhere and run into the road. There was never a Johnnie Jackson with a vintage Thunderbird ride to collide with the never was Odile McDonald, so there was never a wreck. And yet the not-a-wreck happened here of all the many crossroads or near-crossroads in Atlanta. Why will be covered in the next installment, or maybe the one after that (I like to keep my options open) but in all likelihood the why has to do with Odile’s UFO. [highlight highlight_type=”italic” color=”yellow”]Part three in a series of posts on subjects found in the book Thunderbird and the Ball of Twine. For part two click here. You know how it is when you are going some place new and far away and you kind of try to picture in your head what that place will look like and at the same time you don’t so you’ve multiple sometimes wildly diverse variations on a theme that morph and meld and reconfigure themselves? Or maybe that place is so unimaginable that its physical world synonym is the distant cloud traveling with you down a boring stretch of interstate, a cloud which is so blankly without distinguishing features that it is nothing but “distant cloud”? [highlight highlight_type=”italic” color=”yellow”]Part two in a series of posts on subjects found in the book Thunderbird and the Ball of Twine. For part one click here. 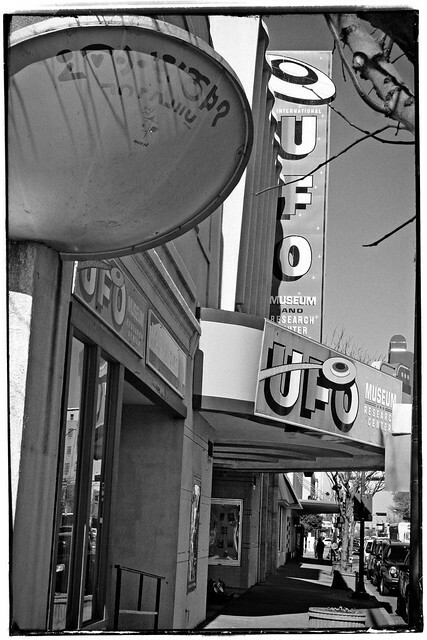 We are back in Roswell, New Mexico, at the International UFO Museum and Research Center, at 114 Main Street, which used to look like this in 1988. The above is not my photo. 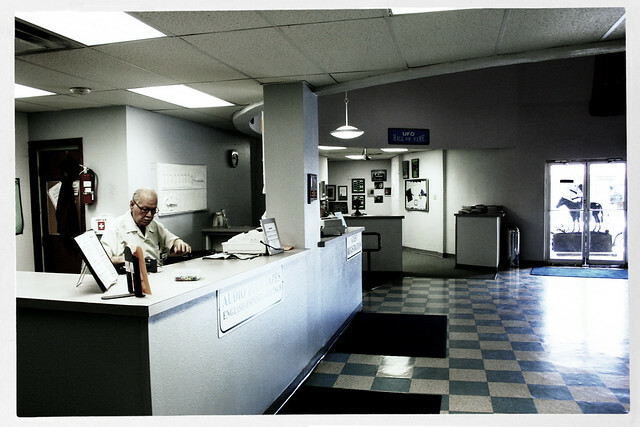 The picture is one from Don Lewis’ Flickr photostream of Vanishing Movie Theaters. The museum was originally a movie theater, the Plains. 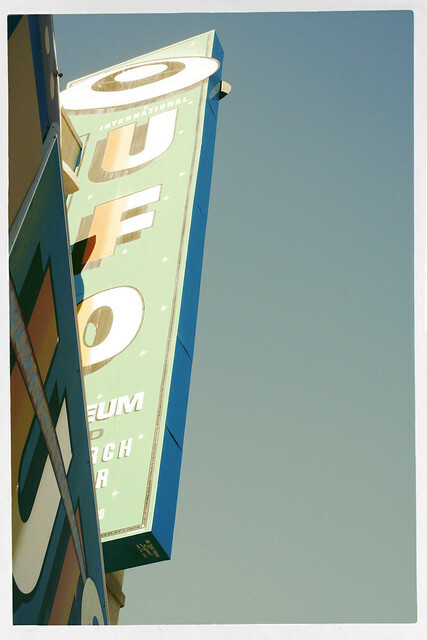 It opened in 1947, the very same year of the supposed Roswell crash, and closed in the 70s. In 1947, that theater’s seats were filled with people whose heads would have been buzzing about the supposed UFO debris that was bringing their community so much notoriety. From the 1988 photo, that downtown Roswell had fallen on hard times isn’t unreasonable to assume. The derelict theater, two of its marquees advertising paint rather than movies, is a ragged, sad reminder of Hollywood’s monopolizing Golden Age, and the surrounding establishments look none too happy vacantly reflecting on what the 1980s hath wrought. Then, in 1990, Walter Haut and Glenn Dennis dreamed up the UFO museum, three years after the publication of Whitley Strieber’s wildly successful “visitors” book, Communion, both the hardcover and paperback editions of which were number 1 on the New York Times Best Seller list. In 1989, Strieber’s Majestic, about the Roswell incident, was published. Had Walter Haut and Glenn Dennis not conceived of the idea of a UFO museum in 1990, we should all wonder why not. Majestic, in combination with the proof books about alien visitations could be best-sellers, was tantamount to an Otherworldly Virgin riding in on a cloud over the desert, wafting rose incense down upon Roswell (presumably mixed with ethereal oils), and saying, “Here is where you shall construct my cathedral. Build it, and they will come.” One can be thankful that a museum was the result and that the seats of the theater were removed, rather than having kneeling benches added and missals composed of extracts from Communion. But I imagine Strieber wouldn’t have been too thrilled had they called him to officiate over the wine and wafer at the Plains’ next incarnation. But who are Walter Haut and Glenn Dennis, in case you don’t know? 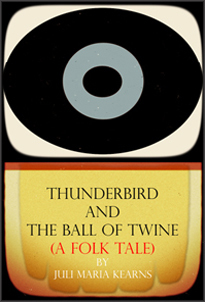 [highlight highlight_type=”italic” color=”yellow”]Part One in a series of posts on subjects found in the book Thunderbird and the Ball of Twine. To where would Odile McDonald have made a point of making a pilgrimage after having seen a UFO? Okay, well, maybe not exactly a pilgrimage, but perhaps on a kind of must-stop-by lark. Especially if she was in the area. Somewhere within, five hundred miles, maybe seven-fifty on the outside. Let’s say she was driving through Kansas on her way to Cottonwood, Arizona. Why skip Roswell when it’s so conveniently on the way? (If you believe Roswell is conveniently between Kansas and Cottonwood, Arizona then you need to make a trip to Google Maps and do a destination search.) Not that she would have known anything about Roswell and the UFO that supposedly crashed there in the summer of 1947 (at least, not anything more than what a quick visit to Wikipedia might tell her), and not that she would even believe in a physical UFO crashing at Roswell and some surviving aliens being captured by the army and then not surviving and being autopsied. Having concocted Odile as a character for Thunderbird and the Ball of Twine, I can tell you for a fact she would be a skeptic. But I figured this would be just the kind of joy ride into shady mythologized territory that Odile might take and, as I had just begun writing Thunderbird, and, as I was on my way from Kansas to Cottonwood, I made the point of fitting in a visit to Roswell to see what there was to be seen at the International UFO Museum and Research Center. In fact, I ended up visiting twice, two years apart. Because I’d had a really good meal in Roswell the first time. Well, I’d had a really good meal the day after I’d gotten sick after eating at a steak restaurant that had been recommended by the desk clerk at the hotel. Maybe I became sick because I rarely ate steak. All I know is for sake of Thunderbird and Odile, I went to Roswell, was hungry when I got there, asked where was a decent place to eat, was directed to a steak restaurant that was very packed-full-of-people-busy, had a not very good meal that was still okay to me as I was that hungry after a long several days of driving, went back to the hotel and a couple of hours later was really sick. Or maybe it was the fault of some food I’d eaten even earlier in the day, or the day before. Let’s get off this subject, shall we? Not a good memory. So, I went to Roswell twice, because of the good meal. And because I wanted some more pics of the International UFO Museum and Research Center (I’ll be using pics from both trips in this series of posts), and because I had just visited The Very Large Array and Roswell lined up nicely on the map as a convenient intermission on my way back east. And if you believe that then you again need to consult Google Maps and see how I had to take little not-interstate 380 through a state’s worth of desert, which was okay as somewhere between Socorro and Roswell I would find myself in the area of the Trinity Atomic Test Site–which has nothing at all to do with Thunderbird and the Ball of Twine but with my having grown up at plutoniumville, USA (aka, Richland, Washington) and my not liking nukes which is of course a reason to visit Trinity and stand a moment and meditate on what was to follow. I had visited The Very Large Array radio astronomy observatory because of the WOW! signal that is part of the plot in Thunderbird. The WOW! signal wasn’t picked up at The Very Large Array. It was detected at Big Ear in Ohio instead, but Big Ear was demolished in 1997. Attempts were made, in 1996-1997, to pick up WOW! at The Very Large Array. So, there I went. To see for myself those great big dishes directed at space.